Donald Trump sold two condos to Eric in April 2016 at a steep discount. But he doesn’t appear to be on the hook for gift taxes. In April 2016, as Donald Trump was on the cusp of clinching the Republican nomination for the White House, he sold two luxury condos near Manhattan’s Central Park for less than half the price his company had said they were worth. The lucky buyer: Trump’s son, Eric. Such family-friendly deals would normally incur hundreds of thousands of dollars in gift taxes. But in this case, Trump appears unlikely to have been on the hook for anywhere near that, thanks to benefits only available to real estate developers. Eric Trump bought the two condos on the two top floors of the Trump Parc East building at 100 Central Park South for $350,000 each. 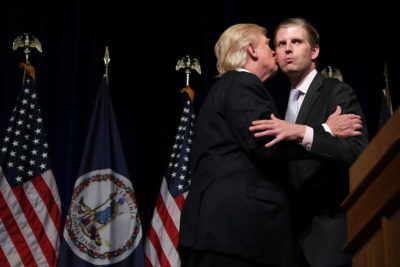 Trump Organization filings show that, as of February 2016 — two months before Trump sold the apartments to Eric — the condos were priced at $790,000 and $800,000. A similar one-bedroom condo on a lower floor at the same building sold for $690,000 in 2014. The transactions illustrate the unique advantages that real estate developers like Trump have when passing down valuable assets between generations. An owner who sells real estate for less than it’s worth would typically have to pay gift tax on the difference between the sales price and the true market value. Any personal gifts that are worth more than $14,000 in a year are subject to up to 40 percent in federal taxes. But as the building’s developer selling the units for the first time, Trump had lots of flexibility within the law to determine the value of the apartments. The units were originally rent regulated, which would typically lower the value of the apartments significantly. New York City records state that the condos are no longer rent regulated. It’s not clear when they were deregulated, but the result is that Eric Trump will likely be able to sell the apartments at significantly higher prices. It’s also unclear if anyone currently lives in the condos. The younger Trump bought another, much larger, apartment in the building for $2 million in 2007. It’s ultimately unclear how much, if any, taxes Trump paid on the transactions. The Trump Organization, the White House and Eric Trump did not respond to requests for comment. But other taxes paid on the transaction suggest gift taxes were not paid. Trump paid a total of $13,000 in city and state transfer taxes, New York City property records show. Those transfer taxes, according to a spokeswoman for the city’s Department of Finance, are not usually paid when “bona fide gifts” are involved. Also, when a sale is reported as a gift, buyers and sellers typically disclose in transfer records that the sale is taking place between two relatives. The Trumps did not. Trump has said that he, like many Americans, wants to keep his taxes at a minimum. “I fight like hell and pay as little as possible,” he told CBS’ “Face the Nation” in August 2015. Trump has proposed repealing the estate tax entirely. The condo sales were disclosed in President Trump’s 2017 federal financial disclosure, which was released by the U.S. Office of Government Ethics last month. The buyers were listed as two limited liability companies. After we asked readers to help us analyze the documents, a reader flagged the deals and noted that the LLCs listed as the buyers were managed by Eric Trump. Trump bought the Central Park South building in 1981 and later converted it into condos. The building’s 80 units were initially filled mostly with wealthy rent-regulated tenants who had the right to keep renewing their leases at below-market rates as long as they chose to remain in the building. That interfered with Trump’s plan to tear down the building and replace it with a condo project. Under New York laws, developers who convert apartment buildings into condos must disclose to the New York state attorney general how much they’re looking to sell units for to existing tenants as well as to the public. Trump’s 1997 disclosure to the attorney general, known as an offering plan, shows that units 13G and 14G were both rent regulated and originally listed for sale at $245,000 and $250,000, respectively. Over time, as market prices moved higher, Trump filed frequent amendments raising the listed prices, a standard practice for developers. ProPublica and The Real Deal obtained the offering plan and amendments through a public-records request. Trump reported nearly $3.2 million in revenue in 2016 and the first half of 2017 from condo sales using the company, Trump CPS LLC. He resigned as president of that company on Jan. 19, the day before his inauguration. As with the president’s other assets, Trump CPS LLC is held by the Donald J. Trump Revocable Trust and is managed by one of Trump’s lawyers and the president’s sons. Trump put his businesses under the trust in response to criticism about conflicts. As we have reported, President Trump can take funds from the trust any time. Do you have information about the Trump family’s businesses? Contact Derek at [email protected] or via Signal at 573-239-7440.